He's one of the "50 Best Brains in Science," according to the editors of Discover Magazine. 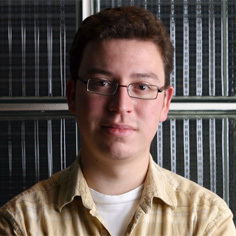 Luis von Ahn, assistant professor of computer science at Carnegie Mellon University, was cited for his work on "human computation" including his reCAPTCHA project and Games with a Purpose (GWAPs). "I feel humbled and honored to be put on a list that includes such distinguished scientists as Stephen Hawking and Jon Kleinberg," von Ahn said. His reCAPTCHA project is a new version of the "distorted letter" tests, called CAPTCHAs, that he helped create. These tools are used millions of times each day to ensure users of a website are human, not spammer programs. Instead of using artificially distorted letters or numbers, reCAPTCHA uses words from printed texts in the process of being digitized but that cannot be deciphered by optical character-recognition programs. By solving the reCAPTCHA puzzle, a human user not only gains access to a website but also helps make more books available online. So far, more than 400 million people have helped decipher billions of words via this project. That's more than 5 percent of the world's population. Von Ahn's first GWAP — the ESP Game — displays identical images to a pair of players who have to "think alike" when they type in descriptive words. When their descriptions match, players earn points and move on to the next image. Matching descriptions helps create tags that can be used to improve image search capabilities. Search giant Google has licensed the technology as the Google Image Labeler. "I believe we're only seeing the tip of the iceberg in terms of what can happen when everyone is connected to each other," he said, referring to the Internet's popularity. "Because of computers — and because they are so pervasive now — computer science is increasingly at the forefront of societal change, scientific change and scientific understanding." Von Ahn received a John D. and Catherine T. MacArthur Foundation "genius grant" in 2006 and a Microsoft Research New Faculty Fellowship in 2008. A native of Guatemala, he graduated with a Ph.D. from Carnegie Mellon's School of Computer Science before he became a faculty member in 2006. "The external reputation of Carnegie Mellon is such that we are very pragmatic," he explained. "We want to solve real world problems — big real world problems. And I think that's something that differentiates Carnegie Mellon from a lot of other places."